I have thought often about what it might be like to be a right whale, but of course I only have my human senses to compare it to. From my perspective, I think about what it might be to spend life mostly in the dark (at night or at depth), having to find enough of the rice-sized copepod plankton to feed a hungry belly, finding a mate that can't be seen, and keeping a one ton newborn calf well-fed and safe. Clearly right whales are well-adapted to manage all of the above, but what concerns me most are the things they are not adapted to: the chronic noise pollution from the extensive vessel traffic that transits day and night throughout their range which masks their vocalizations and limits their ability to find each other; the fear that must be palpable when one of those vessels gets louder and louder as it unknowingly steams towards them but can't be seen—which way to turn to escape the deadly hull and propeller? ; and the panic that must set in when, while searching for food at depth with a mouth wide open, an unseen rope attaching a buoy at the surface to fishing gear at depth becomes caught in the long baleen plates hanging from the roof of the mouth, causing a frantic struggle to get to the surface to breath and to hopefully escape from the heavy gear and constricting ropes. Catalog #2301 entangled in 2004. This whale had rope through the mouth which was tightly bound around the flipper, an entanglement that ultimately lead to #2301's death six months later. Photo: NEAq. This latter scenario of entanglement is the focus of a recently published paper by myself and colleagues here at the New England Aquarium. 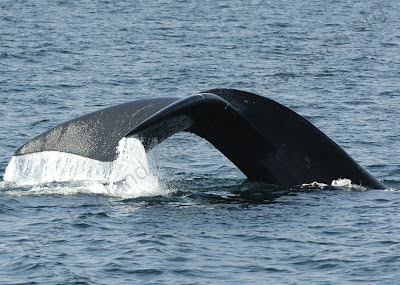 In this paper we reviewed up to 30 years (1980-2009) of photographs for each individual right whale, looked for evidence of entanglement related scarring on all different areas of the body, and noted which animals were witnessed carrying rope likely to be from fishing gear. We determined that 83% of this small population has evidence of at least one entanglement interaction, with some animals experiencing as many as seven entanglement events. 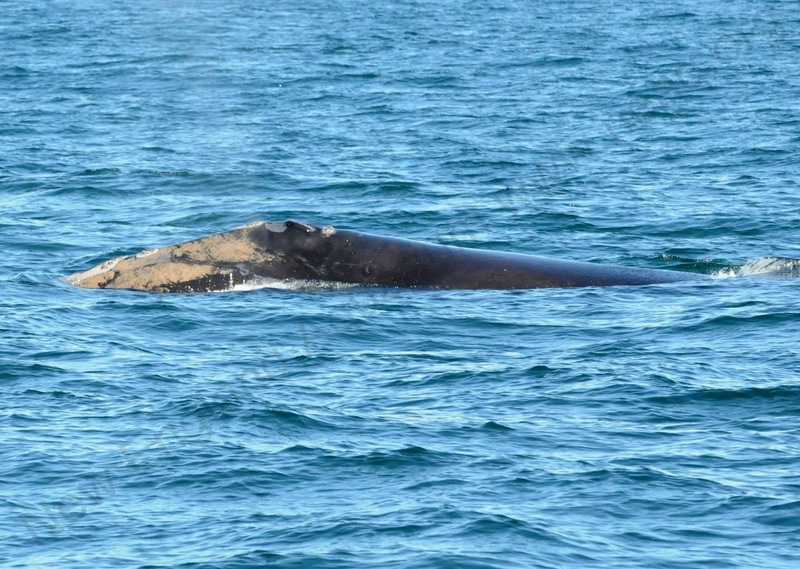 Due to dedicated survey efforts, many whales are sighted and well-photographed from one year to the next, making it possible to notice when new scars appear in a relatively small time frame. Using this well-documented part of the population, we determined that annually, on average, 26% of these animals had obtained new entanglement scars or were carrying gear. 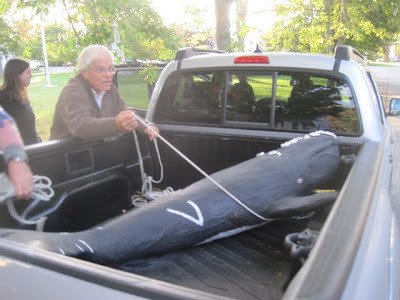 A total of 1,032 unique interactions were documented, resulting in minor to moderate scarring for many right whales, but serious and often fatal entanglements for 86 individuals. And the rate of serious entanglements has increased over the 30 year period. The entanglement issue remains the most serious conservation concern facing this small population. Expanded fishing effort along the eastern seaboard over the past several decades and the use of stronger ropes and heavier gear is just one more insult we have imposed in the oceanic realm, where it can be all too easy to ignore the impacts. 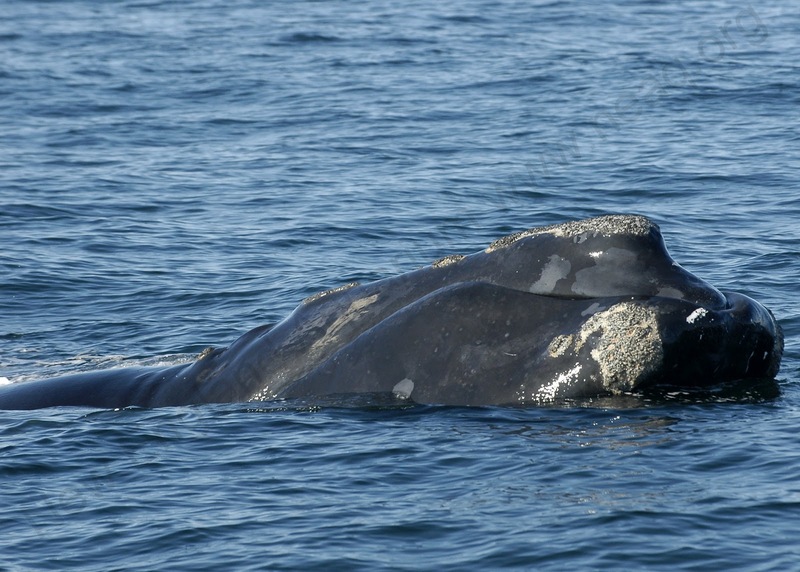 Right whales are in a very real sense a "canary in the coal mine" for understanding what is happening offshore. And we will continue our efforts to work with government and industry to try to find solutions to this complex issue. If you are interested in reading the recently published paper for more details, it is available for free at the Marine Ecology Progress Series journal. A short video filmed from the bow of the R/V Nereid, showing the 2011 calf of #1243 breaching in the Bay of Fundy on 21 August 2012. Compare to BOF 2011 By The Numbers! We took advantage of fair weather on September 28 to relocate our research vessel to its winter home at James Rich Boatyard in West Tremont, Maine. The good folks there have been taking care of the R/V Nereid since the mid 1990s. During the off-season, the Nereid will get her usual painting and buffing and as well as a new depth sounder. 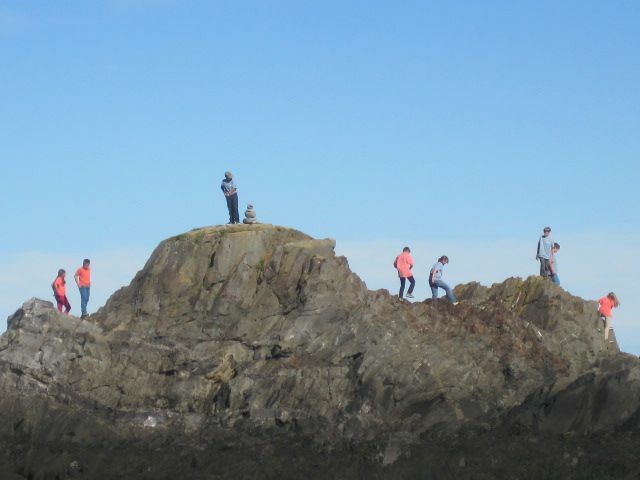 The last weekend in Lubec was spent packing up all the research equipment and data. The team headed back to their offices at the Aquarium in Boston on October 1, eager to finish up the season's photo analysis to determine how many individual right whales were accounted for in Fundy. Two of us stayed on for an extra week, hopeful for one more clear day to sneak back out into the Bay to see if there were any lingering right whales. Wednesday, October 3, dawned clear and bright, although with a little more wind than forecast. 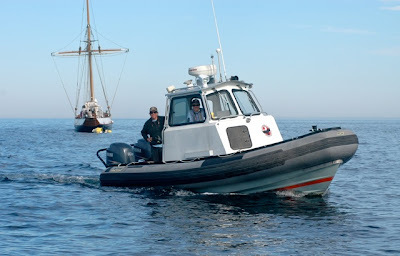 Amy and Moe borrowed the FRC (Fast Rescue Craft) from the Campobello Whale Rescue Team for one last survey. Amy (left) and Moe on the 24 foot long FRC Hurricane used by the Campobello Whale Rescue Team to respond to entangled whales in the Bay of Fundy. The sailboat to the left is the Jolly Breeze, a whale watch boat from St. Andrews, NB. Photo: Chris Slay. Our efforts were rewarded with the sighting of two right whales! The two whales were travelling together, and Amy collected photos before they disappeared from sight. Near the end of the day, we joined up with the S/V Jolly Breeze and friend Chris Slay on the R/V Jupiter to enjoy some time with a rare species in the Bay of Fundy, an orca! Old Thom in the Bay of Fundy. Photo: Amy Knowlton. 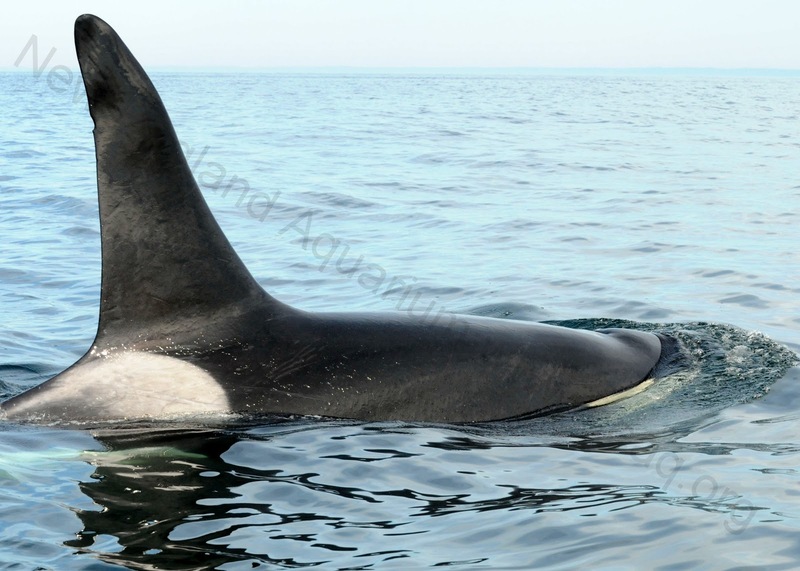 This lone male orca has been seen several times in the Bay of Fundy in 2012 and was seen during our surveys of Roseway Basin in August 2010. 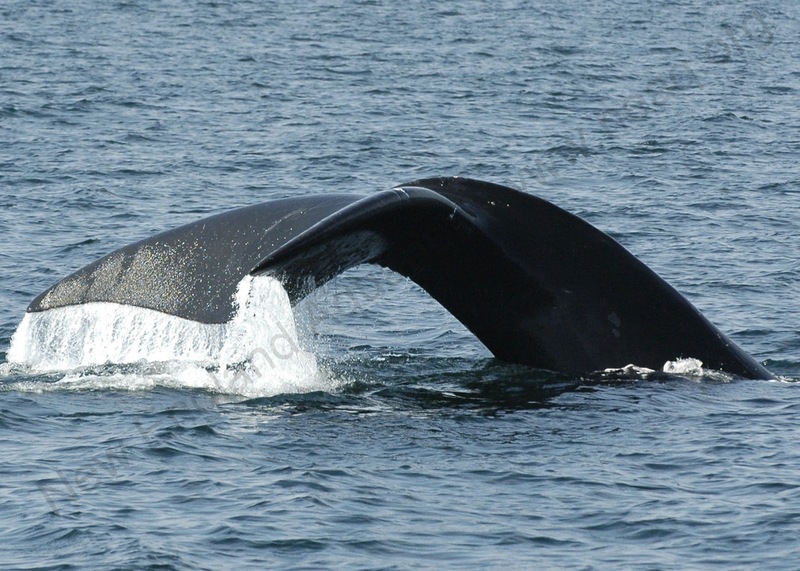 A male as determined from the large dorsal fin, this whale is identified by the two knicks in its dorsal fin near the top, and is an individual known as "Old Thom." A catalogue of orca sightings in the Atlantic is maintained in St John's Newfoundland. This rare sighting rounded out a season of unusual observations, including a bowhead whale, sperm whales, blue sharks and white beaked dolphins. 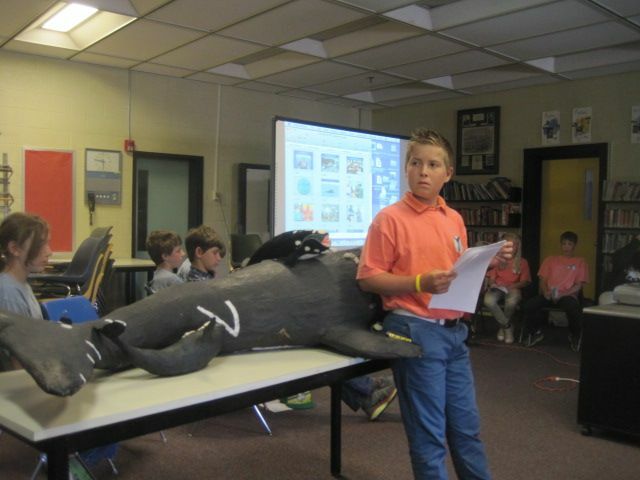 #21: Calvineers Educate Downeast Schools about Right Whales! The CALVIN Project was started eight years ago, with the mission of "Endangered Species Recovery Through Education" and a focus on North Atlantic right whales. 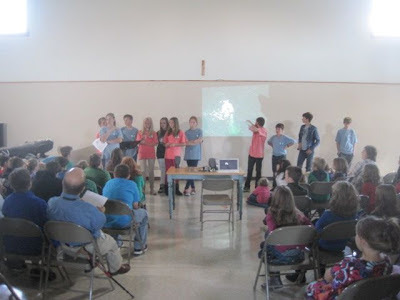 Members of The CALVIN Project are called "Calvineers," and consist of 7th and 8th grade student scientists from the Adams School in Castine, Maine. Earlier this year, this amazing group was recognized for their hard work by becoming finalists for Oceana's Ocean Heroes Award! 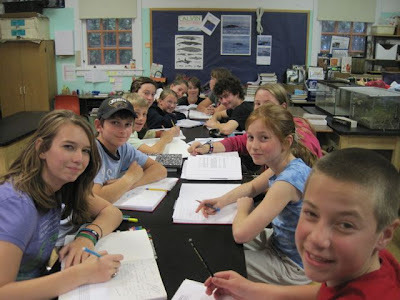 Calvineer student scientists spend one hour a week in school studying whales and how they relate to the topics they study in science class, ranging from anatomy and physiology to Newton’s laws and the study of sound waves. They also volunteer an hour after school each week to do a research project of their own on a current topic related to right whales. Calvineers doing research on a Thursday afternoon. Each Calvineer has a scientist mentor from the Right Whale Consortium who they can e-mail with questions and comments about their topics. Topics being studied include: stress hormones, entanglements, health assessment, ship strikes, necropsies, fishing gear, acoustics, scarring, food, habitat, laws and regulations, ethics and so on. Each Calvineer produces PowerPoint slides explaining their topic and how it figures into the right whales’ current situation. All the slides are woven together into a PowerPoint presentation that revolves around the life story of the most famous right whale of all, Calvin- Catalog #2223. Calvin’s life story was chosen as a theme because she has experienced all the joys and pitfalls that the modern right whale faces. Calvin was present when her mother was killed by a shipstrike, and Calvin herself was once severely entangled. Calvin has also spent many tranquil seasons in the Gulf of Maine and has given birth to two calves. She knows what it is to be a modern right whale in an urban ocean. The student scientists do the PowerPoint presentation themselves. Each Calvineer talks about her/his research as their slides are displayed. The talk is informative with many details about the whales, the scientists and the regulations in place. The presentation ends with a message from Calvin herself and suggestions of ways the average person can help right whales recover from being endangered. These students never miss an opportunity to educate people about right whales. So, when a teacher from Whiting School in Maine dropped by the Research Station in Lubec one day and inquired about a presentation for her students about right whales, the request was immediately passed on to me since I was volunteering at the station and, more importantly, I am the Principal Investigator (PI) for The CALVIN Project. 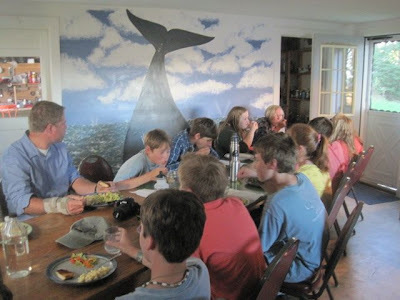 Soon an all-day trip to Lubec area was planned for the Calvineers so they could present their story about right whales to students at the Whiting School, Lubec School, and the Edmunds Schools too! On Monday, September 24th, twelve Calvineers piled into two mini-vans and a truck at 7:00 AM. In the bed of the truck was a 7-foot model of a right whale based on the necropsy data from Calvin’s mother, Delilah (Catalog #1223). The model is one-seventh the size of Delilah, who was 49 feet long! The two and a half hour drive to Lubec from Castine went fast, as the students entertained themselves with word games and road games. A few read over their notes to be sure they were prepared for the presentations. Calvin's 1/7th model is loaded into the truck. The Calvineers arrived at the Lubec School in plenty of time to set up. Grades 3-8 came to the presentation- about 45 students and teachers in all! Two right whale scientists working at the NEA Research Station, Grace Conger and Dan Pendleton, along with Claudia Pendleton, the cook from the Research Station, also sat in. The other research scientists would have loved to join, but they were braving the seas on their boat, looking for right whales! Presenting at the Lubec School. After the presentation, the Calvineers fielded questions from the crowd. Some of the best were: “Why are they named right whales?”; “How old do they live?”; and “What kind of teeth do right whales have?” The Calvineers sometimes do not know the answers to questions but are quick to turn the question over to their PI or other scientists in the crowd. At this presentation, someone asked if right whales are in the Gulf of Mexico (because they wondered if the oil pollution affected them.) Hanna said only one or two right whales were ever documented in the Gulf of Mexico but she did not know which whale it was. NOAA scientist Grace Conger informed the crowd that the whale was Derecha, Catalog #2360. Derecha is actually one of the whales referred to in the PowerPoint, so we all learned something new that day! 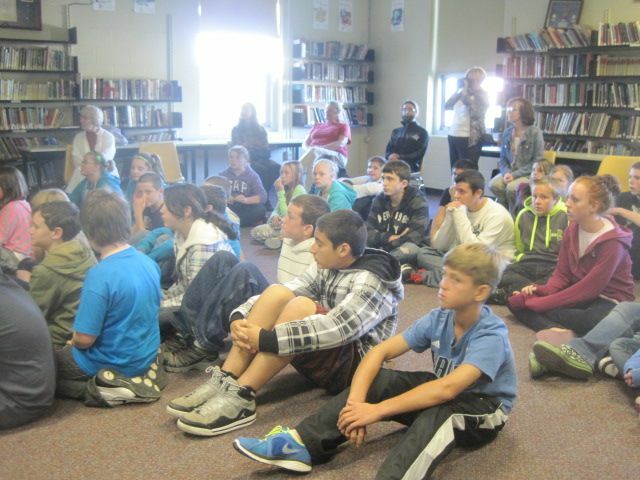 Our audience at the Lubec School. The Lubec School gave the Calvineers a free lunch (they still do exist! ), and then they were off to the town of Whiting for their second presentation. The Whiting School of 30 K-8 students was joined by about 50 5th-8th grade students from the nearby Edmunds School. The second presentation was as good as the first and the students had even more questions for the Calvineers! The Calvineers answer questions from students from Whiting and Edmunds Schools. Just because the presentations were done, however, the day was not over for the Calvineers! We took advantage of the fact that we were near the Eastern-Most Point in the United States- West Quoddy Head. They visited the lighthouse there, and afterwards explored the small waterfront town of Lubec, watching scores of seals feeding in the strong currents while collecting in the littoral zone between the 20-foot tidal range. The Calvineers found their way to the New England Aquarium Right Whale Research Station, got a tour, and played various forms of tag in the large backyard. At five o’clock sharp, the dinner bell rang and the Calvineers settled in at the very table the NEA researchers do every evening- there was plenty of room for all fifteen of us! Claudia had cooked up the dish the Calvineers had voted on: Macaroni and Cheese. But this wasn't just any kind of Mac and Cheese- it was Claudia’s special creation, and so the two large baking dishes disappeared in no time. Along with the homemade garlic bread and fresh salad, it was quite a meal. Two Calvineers cleaned the table and loaded the dishwasher just like the scientists do. The final touch has become a tradition for Calvineers (Editor's note: and for the lucky researchers too, when we're fortunate enough to have Bill visit! ): the PI passed out delicious, homemade peanut butter cups to all to signal yet another “job well done” on their part. Eating dinner at the NEA Research Station. The Calvineers were on their way back to Castine by 6 PM and were all delivered to their respective homes around 9 PM. 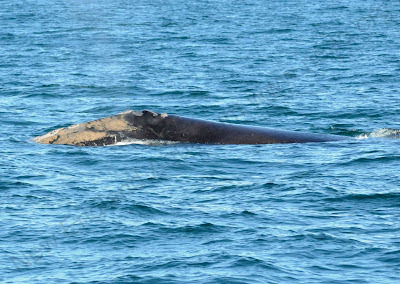 It was another long day for the Calvineers but they all could go to sleep knowing they had reached another 100 people, and perhaps that might be the tipping point that gets right whales off the endangered species list.